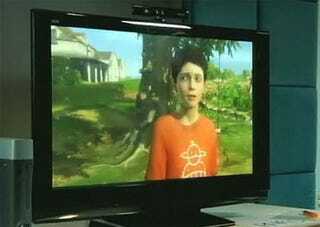 Peter Molyneux appeared on stage today at the TEDGlobal 2010 to show off Milo, the virtual boy for Microsoft's Kinect that failed to make an appearance at E3 2010. How far has the character-driven game come since Project Natal's debut? "This talk is going to be a little bit insane," began Molyneux, showing off a more refined version of Milo than the one that wowed E3 attendees last year. Instead of showing off a pre-rendered video, the head of Lionhead Studios invited a volunteer on stage to help demonstrate Milo during the conference in Oxford, England. Milo is Molyneux's attempt at tricking people into believing there is a real living being residing inside their video game console. During the demo, Molyneux and his volunteer, Dimitri, taught Milo how to skip rocks and helped him clean his room. At one point, Milo expressed sadness over a recent move. Dmitri cheered him up. He even asked Milo to squash a snail. After a moment of hesitation, Milo did so. Milo is a virtual snail murderer. "I love these revolutions and I love the future that Milo brings," concludes Molyneux, before giving up the stage to Annie Lennox. Poor Annie. Rule one of show business: Never follow children or animals, virtual or otherwise. It's good to hear Milo is alive and well. We missed him at E3 2010, and look forward to playing with him again soon. This story was pieced together from Tweets from the official TEDNews Twitter. Look for a video of the demonstration to show up on the TED Blog later this week.